*Disclaimer* A special thanks goes out to William Morrow at Danielle for a review copy of this book. It in no way influenced my review. You can discuss it here or join my facebook page and discuss it there. *Disclaimer* A special thanks goes out to Joanne at William Morrow for a review copy of this book. It in no way influenced my review. You can discuss it here or join my facebook page and discuss it there. A young woman is employed as a psychiatrist at an asylum. Her world is changed when a young man named Jason is admitted to the hospital. Jason has a tale to tell about a terrorist group, the FBI, and the CIA. She soon finds that someone wants her dead to keep this information quiet. Lise Shields – A Young psychiatrist. Jason Edwards – A patient of Lise’s. The author with this really managed to keep me guessing. Was Jason honest, or were his stories the product of a disturbed mind. That is where one of the strongest aspects of this novel come in, how it treats the subject of mental illness. Part of this is addressed through Jason, but other parts are told through Lise’s memories of her Uncle Jim. Uncle Jim is a character I could relate to. While I’m not sure of the diagnosis I went through similar things to Lise with a member of my family when I was 13 or so. The symptoms were very much like Uncle Jim’s. Paranoia and thinking everyone was out to get them. So this storyline hit very close to home for me, and I can attest to the author’s accuracy in telling it, and his compassion in treating it with such respect. The characters are all extremely well developed, and for the main characters, we get to see a lot of their background. Parts of the story keep flipping to the past, so we can see events as they play out. That I think was a nice touch. Overall the novel was beautifully written, and one I could see definitely becoming a hit on the silver screen. I would rate it as PG-13 due to acts of violence, and some language. For those wanting a well written, psychological thriller with the emphasis on psyche, you definitely want to pick this up, I don’t think you’ll be disappointed. Be sure to drop back by and let us know what you thought. John Burley was born in Baltimore, Maryland and grew up near the Chesapeake Bay. Following high school, he attended University of Maryland, graduating with Bachelor of Science degrees in psychology and physiology. During his undergraduate years, John also trained as a paramedic/firefighter and served for many years in that capacity in a busy 911 jurisdiction in Montgomery County, Maryland, just north of Washington, D.C. He later completed a Master of Science program in medical pathology and attended medical school in Chicago, earning his Doctor of Medicine from Rosalind Franklin University before returning to Baltimore to complete an emergency medicine residency training program at University of Maryland Medical Center and Shock Trauma. After graduating from residency, John moved to California, where he began work on his first novel. Four years later, the manuscript was purchased by William Morrow, an imprint of HarperCollins. The Absence of Mercy was published in November of 2013. It received the National Black Ribbon Award in recognition of an author who brings a fresh, new voice to suspense writing. John currently lives in the San Francisco Bay area where he works as an emergency department physician. 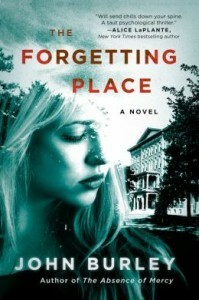 His second novel, The Forgetting Place , is scheduled for release on February 10, 2015.